Events such as the Shoemaker−Levy 9 comet impact into Jupiter (July 1994) and the Chelyabinsk meteorite impact in Russia (February 2013) are reminders of the dynamic processes that were part of the formation of our Solar System from a protosolar molecular cloud of interstellar and circumstellar dust and gas. High-temperature (up to 2000 K) transient heating events (e.g. shock waves, current sheets, lightning, etc.) resulted in thermal processing (evaporation, condensation, and melting) of the primordial molecular cloud matter. In general, however, the ambient temperature of the disk decreased radially from the proto-Sun. When temperatures fell below 160 K, water vapor condensed directly into water ice, forming a front known as the “snow line”. The snow line likely did not reside at a single location in the disk, but rather migrated as the luminosity of the proto-Sun, mass accretion rate, and disk opacity all evolved with time. Some models suggest that the snow line could be located at about 5 astronomical units (1 AU = average distance between Earth and the Sun) early in disk evolution, which is not far from Jupiter’s current orbit, but is likely to have been present at 2−3 AU when the disk was just 2−4 My old (Ciesla and Cuzzi 2005). With increasing radial distance from the proto-Sun, the temperature became so frigid that, in addition to water ice, other ices formed out of CO2, CO, and CH4. These ices (where present), organic molecules, and anhydrous silicates were the major ingredients that accreted into planetesimals—the building blocks of the inner and outer Solar System planets. Disk materials that did not accrete into planets are represented by asteroids (located in the main asteroid belt, 2–4 AU from the Sun) and comets (located outside Jupiter’s orbit). Samples returned by the Japan Aerospace Exploration Agency (JAXA) and NASA missions to asteroid Itokawa and comet 81P/Wild 2, respectively, provide important information about disk processes in the nascent Solar System, as do interplanetary dust particles and meteorites. The vast majority of meteorites in national, university, and private collections are fragments of bodies from the main asteroid belt: the samples include iron, stony-iron and stony meteorites. Stony meteorites can be divided into achondrites (fragments from the silicate portion of bodies that were heated to the point that the metal and silicate components separated during a process known as “differentiation”) and chondrites (fragments of bodies that experienced thermal metamorphism and aqueous alteration to various degrees, but avoided melting and differentiation). Based on their bulk chemical and isotopic compositions, chondrites are divided into fifteen groups, comprising three major classes: carbonaceous chondrites (CI, CR, CM, CO, CV, CK, CB, CH), ordinary chondrites (H, L, LL), enstatite chondrites (EH, EL), as well as the R and K group(let)s. Each chondrite group is believed to have originated from a single parent body. Ordinary chondrites have undergone relatively little aqueous alteration. They have, however, experienced various degrees of thermal metamorphism and are spectroscopically similar to silicate-rich, stony-type asteroids (S-type). Carbonaceous chondrites have not experienced much heating and range from those that have undergone a lot of aqueous alteration to those that are relatively pristine. Carbonaceous chondrites are spectroscopically similar to carbonaceous-type asteroids (C-type). Astronomical observations indicate that the S-type asteroids are concentrated in the inner portion of the main asteroid belt, whereas the C-type asteroids are predominantly located in its outer region. Has this pattern existed since their accretion? Or were hydrated, C-type asteroids accreted beyond Jupiter and subsequently implanted into the outer regions of the asteroid belt (e.g. Walsh et al. 2011)? There is no easy answer, but one may glean insight from the accretion age of the chondrite bodies in relation to the predicted position of the snow line over time. Figure 1. (A) Schematic of ion probe pit sizes from primary beams three and five microns in diameter compared to the thicknesses of human hair (Ley 1999) at the same scale as shown in (B). 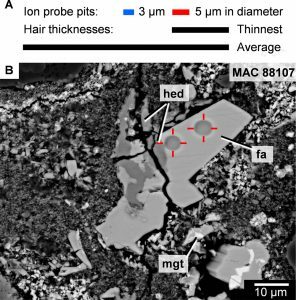 (B) Backscatter electron image of an assemblage of fayalite (fa), hedenbergite (hed) and magnetite (mgt) in MAC 88107, with two ~5 micron diameter ion probe pits from Mn,Cr isotope ­measurements by secondary ion mass spectrometry (SIMS). Minerals such as phyllosilicates [sheet silicates], carbonates [(Ca,Mg,Fe,Mn)CO3], magnetite (Fe3O4), fayalite (Fe2SiO4), kirschsteinite (CaFeSiO4) and hedenbergite (CaFeSi2O6) formed by aqueous alteration on the chondrite bodies, and they record information about the temperature of alteration, water/rock ratio, pH, activities of soluble elements, oxygen and hydrogen isotopic compositions of water, and timing of alteration. The period during which asteroids experienced aqueous alteration can be inferred from 53Mn–53Cr isotope dating of carbonates, fayalite (Fig. 1), and kirschsteinite formed during this alteration. The systematics of in situ Mn–Cr isotope dating using secondary ion mass spectrometry (SIMS) or ion microprobe has been summarized in detail elsewhere (e.g. Krot et al. 2006; Sugiura et al. 2010; McKibbin et al. 2013; Doyle et al. 2015, 2016). Recent developments include the synthesis of Mn,Cr-bearing phases that are similar in composition to the meteoritic minerals being analyzed and are used as standards in SIMS measurements. Mineralogical observations and thermodynamic analysis indicate that carbonates (calcite, dolomite, breunnerite) and the iron-rich end-member of olivine (fayalite) formed in the presence of aqueous solutions on the chondrite parent bodies. These minerals have high MnO contents (up to several wt%) and low concentrations of Cr2O3 (<<0.1 wt%), making them suitable for age dating using 53Mn–53Cr isotope chronology. Carbonates and fayalite are both present in the carbonaceous chondrites. Specifically, carbonates are observed in the CI (Ivuna type), CM (Mighei type), and CR (Renazzo type) carbonaceous chondrites, most of which have experienced high or moderate degree of aqueous alteration. Fayalite is found in the CV (Vigarano type) and CO (Ornans type) carbonaceous chondrites, which have experienced a very low degree of aqueous alteration and little heating. In addition, fayalite is observed in L (low iron type) and LL (low iron, low metal type) ordinary chondrites. Consequentially, fayalite can be used to date aqueous alteration in both ordinary and carbonaceous chondrites. Figure 2. Chronology of secondary fayalite and calcite in carbonaceous chondrites and the model-dependent accretion ages of their parent bodies. Time zero on this plot is 4,567.3 ± 0.16 Ma (Connelly et al. 2012), which is the age of the Solar System based on the U-corrected Pb–Pb absolute age of CV CAIs. CM calcite data from Fujiya et al. (2012) and CV and CO-like fayalite data from Doyle et al. (2015). Manganese and chromium isotopes in fayalite from three aqueously altered chondrites [Elephant Moraine (EET) 90161 (L3), Asuka (A) 881317 (CV3), and MacAlpine Hills (MAC) 88107 (CO)] were used to determine the ages of fayalite formation. The inferred ages range from 2.4 My to 5.1 My after the formation of the CV calcium–aluminum-rich inclusions (CAIs) – the oldest dated Solar System solids (Fig. 2). 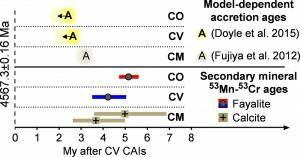 The ages of fayalite in the CV- and CO-like carbonaceous chondrites are in excellent agreement with the age of aqueously formed calcite in the CM carbonaceous chondrites (Fujiya et al. 2012). The old ages of these minerals indicate that liquid water was present in asteroids early in the Solar System’s past—millions of years earlier than previously reported (e.g. Krot et al. 2006). At that time, the short-lived radionuclide 26Al (t1/2 ~0.7 My) was still alive in the protoplanetary disk where these asteroids accreted. Radioactive decay of 26Al would have generated heat, which could have melted any water ice that had accreted into the chondrite parent bodies together with the anhydrous minerals. The age of fayalite formation in CV, CO, and ordinary chondrites, together with parameters such as the peak metamorphic temperature reached by their parent asteroids (Huss et al. 2006), may be used to infer when and where these asteroids accreted. Using thermal modeling, we determined that the parent bodies of the ordinary, CV, and CO chondrites accreted 1.8–2.5 My after CV CAIs. At that time, the snow line is thought to have been positioned at 2–3 AU from the Sun. This suggests that the parent bodies of the ordinary, CV, and CO chondrites accreted close to the current position of the main asteroid belt (2–4 AU from the Sun), rather than being implanted from beyond Jupiter (>5 AU). This conclusion is consistent with two other lines of evidence. Firstly, water ices that accreted into the parent bodies would have had characteristic isotope compositions, and the inferred deuterium/hydrogen (D/H) isotope ratios of asteroidal water in carbonaceous chondrites are lower than those measured for outer Solar System cometary water (Alexander et al. 2012). Secondly, considering that the average Solar System water/rock mass ratio is ~1.2 (Lodders 2003), the water/rock mass ratio in which fayalite is thermodynamically stable (~0.1–0.2; Zolotov et al. 2006)—taken to be representative of the fayalite-forming region in the ordinary, CO, and CV parent bodies—is much lower than that expected for bodies that accreted well beyond the snow line. As such, existing meteorite observations do not support the hypothesis that hydrated asteroids formed between and beyond the giant planets or that such asteroids were then subsequently implanted into the main asteroid belt during migration of the giant planets. However, our meteorite collections may not include samples of all varieties of asteroidal bodies. Other types of hydrated or water-ice–bearing planetesimals may have been implanted into the outer portion of the main asteroid belt. These bodies are potential targets for sample-return missions planned in our quest to better understand the dynamics of the early Solar System. Ley B (1999) “Diameter of a Human Hair”. The Physics Factbook. http://hypertextbook.com/facts/1999/BrianLey.shtml (accessed June 2016).